When you think about arcade games one of the first images that will spring to mind will be a little yellow monster-munching circle. We are of course talking about Pac Man. Pac Man was an arcade game developed by the Japanese video game developer Namco that was first released in Japan in 1980. Upon its release, Pac-Man did not just become an arcade hit but a social phenomenon. Namco quickly realised that they could increase their revenue through effective marketing. Pac-Man quickly made the transformation from plain old arcade character to a world-renowned character that was found on all sorts of merchandise such t-shirts, bags, trinkets and even an animated television series. After the initial success of games such as Space Invaders, Asteroids and Pong, Pac Man became the first actual arcade game character. Not only is Pac Man viewed as the game that launched a generation of arcade games, it is also the highest grossing video game of all time having generating more than $2.5 billion by the time the 1990s had come around. The game itself is simple and yet highly addictive. 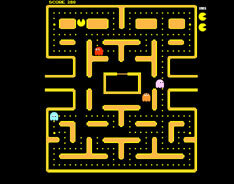 The player controls Pac-Man as he moved through a maze. The maze contains lots of dots and the objective of the game is to eat all of the dots and you will pass that maze and be moved onto another more complicated version. To make things more challenging each maze also contains four enemies called Blinky, Pinky, Inky and Clyde. These enemies try to eat you as you find your way around the maze and you need to avoid being eaten whilst simultaneously eating all of the dots.